Dr. John Holden graduated the medical school from the University of Minnesota Medical School and completed four residency programs. He is now specialized in radiology and interventional radiology and is also board certified in diagnostic radiology. Dr. Holden has been in practice for more than 20 years and is able to use various imaging techniques in order to gather information about the human body. 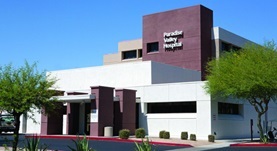 He is affiliated with the Paradise Valley Hospital.